Deputy Defense Minister Rabbi Eli Ben-Dahan visits the Beit El local council. 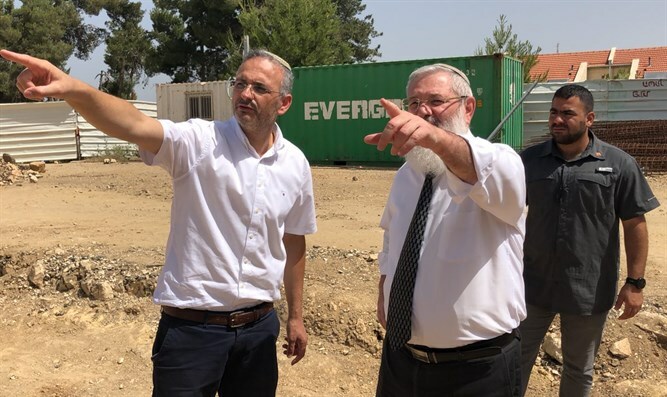 Deputy Defense Minister Rabbi Eli Ben-Dahan (Jewish Home) on Sunday toured the Beit El local council, where he met with the head of the council, Shai Alon, and with the director general of the council, Shira Liebman. During the tour, Ben-Dahan observed the new wall that was built between the council and the Palestinian Arab village of Jalazone. "I am glad to see that the wall that we worked so hard to make a budget for is completed. This wall protects the first row of houses in Beit El, and provides personal security to the residents of Beit El,” he said. "I very much hope that with God's help, the construction of another section of the wall near the local school will be completed," continued the deputy minister. "300 housing units will be built in the near future and the community is flourishing. Much of this is thanks to my cooperation with the head of the council, Shai Alon."